The annual Darkness Into Light Walk which fundraises for the mental health charity Pieta House, will take place in the early hours of Saturday May 10th. 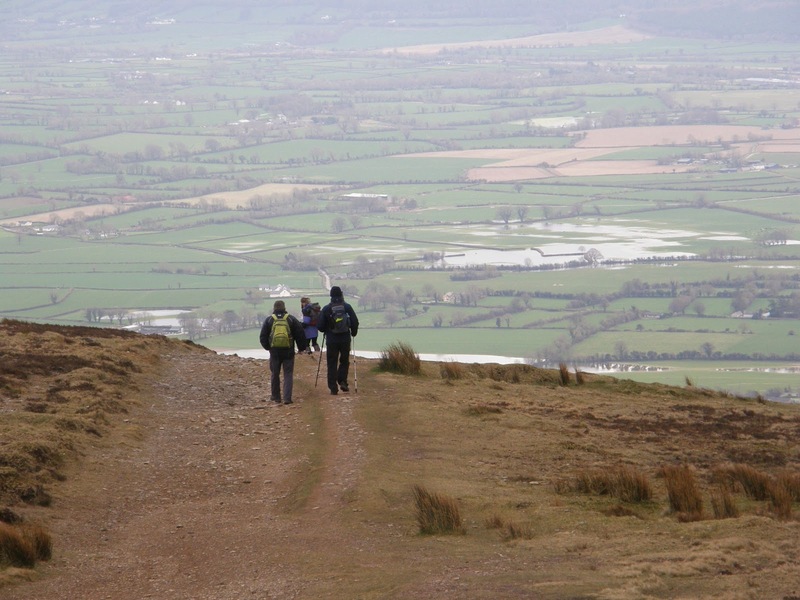 Again, the organisers are looking for members of Dungarvan Hillwalking Club to be marshals. The route is different this year. It begins at St Augustine’s College and heads for Crotty’s Corner, before looping back to the college via the metal bridge. If you’re interested in doing point duty along the route, contact Ted Dipple on 058 20790. We started walking at approximately 10:40 and went up the left side of Coumshingaun, into a cold, finger numbing wind. Visibility was poor for the first few hours but spirits were high. We reached the top of the Coum at about 12:30 and there we were met with ice and snow. After a quick lunch at Richard Dykes’s special lunching spot, we headed for Crotty’s Lake. Visibility was so poor that we almost missed it. On the way home, we crossed Uisca Solus and Coumshingaun Lake for good measure. We finished the day in sunshine. A Splendid St. Patrick’s Weekend. 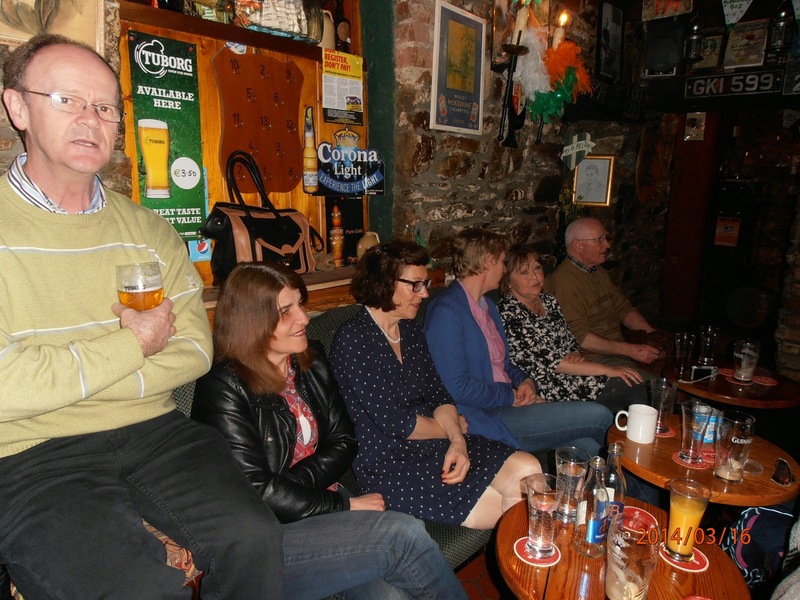 The Dungarvan Hillwalkers were in full song for St. Patrick’s Weekend, with a raucous sing-song in Leneghan’s of Newtown after the dogs’ night on Saturday 15th and a rendition of Slievenamon in the biting cold on the big day itself. 14 people went to the dogs’ night and experienced varying fortunes. 24 brave troopers headed to the top of Slievenamon, ably led by Brian Wickham, and rewarded themselves with a ridiculous amount of cake. On Sunday 9th March, a group of approximately 19 C walkers braved fog to walk to the Bull’s Well near Melleray, via the cross. Leader Michael Hanrahan successfully steered the group home. Two weeks later, in gloriously warm weather, Reenie Palmer led a similar-sized group of walkers along Ballyquin beach in Ardmore, and then along the Ardmore cliffs, where they picnicked in the sun with a friendly seal for company. The B walk coordinators have confirmed that the first B walk of every month will be on a Saturday from now on, at 9am starting from the motor tax office car park, opposite Glanbia. All other B walks will take place at 10am on Sunday, as normal. Comeragh Crossing Quiz 16th May. More details later. And finally...For those of you heading for Leenane on April 25th, the carpooling fee will be €20. Entertainment at Leneghan's pub after the Dogs night. The annual Dogs’ Night will take place on Saturday 15th March at Kilcohan Greyhound Stadium in Waterford City. It’s a bargain at €17 for the entrance fee and a three-course dinner, and if you win on the dogs, the night might pay for itself.. Afterwards, there’ll be a sing song in an as yet, unnamed hostelry. Given the horrific weather and the fact that we were unable to hold our club meeting on February 4th, to spread the word, a very respectable €205 was raised for SEMRA at the Valentine’s Day Table Quiz in the Soccer Club. Richard Dykes, representing SEMRA, thanked the club for their efforts. Eight teams competed for glory and Erich Baumann’s team completed a Valentine’s Day Massacre to grab first place. A few nails where bitten when two more teams slugged it out for second place. Well done to the Smurfs and the Tasmanians, who took second and third place respectively. The club is going to make its own donation and with the club donation and the quiz proceeds, SEMRA will receive €500. A rather violent shower of rain failed to dampen the spirits of the 16 walkers who set out for Portlaw Woods under the leadership of Norman Graham. He set a little obstacle course for the walkers as they clambered over fallen trees. Mercifully there were only a couple of those, but the walkers showed great agility in negotiating them. The walkers took a loop around the woods, culminating in a climb to the cross, where they surveyed the sodden landscape. After that first shower, the weather stayed dry and the sun even made the occasional appearance. The walk took a little over three hours. There’s a healthy interest building for the Leenane trip, so if you’re interested in going, you need to have booked with Richard Dykes and paid by April 1st. You can contact him by phone on 086 2411287 and by email on Richard.dykes1@gmail.com. It’s €99 for two nights, €144 for three nights and €189 for four nights, with a €10 single supplement.